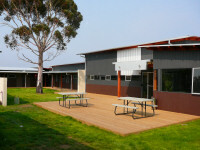 Swansea Backpackers is a purpose built award winning architect designed lodge adjacent to the historic swansea bark mill and museum. within easy walking distance to beaches and shops. cosy family room including pool table, TV, dvd, radio, cd, board games. The latest fire safety and security systems have been installed. Wheel chair access is available throughout the building including, dedicated bathroom facilities. A modern bar, bottle shop and restaurant with wood fired pizzas is located next-door. Tassie link coach company runs a regular service to and from Hobart and will do a courtesy pick up and drop off on request when booking your ticket! NOTE: You need Java installed to view these panoramas. You can download Java here for free.